Shortly after Cleveland Hopkins International airport reported a slight uptick in passenger counts for FY2013 – the first such increase since 2007– the airport’s anchor carrier United Airlines tabled plans to downsize its Cleveland hub significantly. The move is neither surprising nor unexpected given Cleveland’s proximity to United’s large hub at Chicago O’Hare. With all US major carriers moving to centralise their operations in hubs where they maximise connecting revenue, Cleveland’s fate has been sealed for quite some time. In order to gain US government approval for the 2010 merger of United and Continental, the carriers agreed to uphold a certain level of operations at Cleveland for about two years after the merger. So it appears United now has some leeway to overhaul and downsize Cleveland, a hub it claims has been unprofitable for more than a decade. United’s moves in Cleveland reflect its stated philosophy of ensuring every market makes a positive contribution to the carrier’s entire system. Many markets on the chopping block from Cleveland simply could not drive the connecting revenue necessary to make the hub viable. The next chapter, yet to be written, is how the ever-present ULCCs and other low-cost airlines will respond to the opportunities opened up in this way. 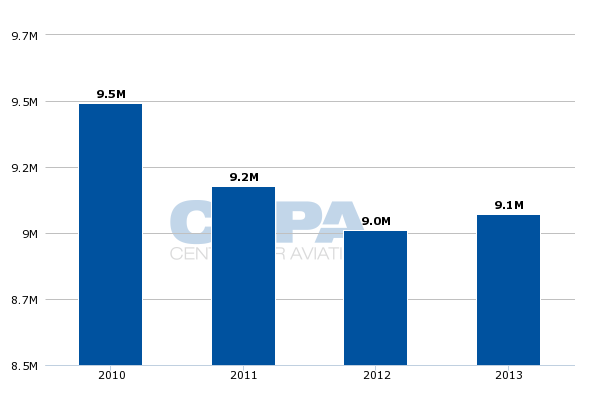 Even as Cleveland eked out 0.7% growth in its passenger number for FY2013 to 9.1 million, since the 2010 merger of United and Continental the number of travellers passing through the airport decreased year-on-year from FY2010 to FY2012 -2.3% in FY2010, -3.3% in FY2011 and -1.8% in FY2012. United’s planned cuts in Cleveland are not as drastic as the pull-down of Memphis by Delta in recent years; but as a comparison Memphis handled 10 million passengers during FY2010 and 4.6 million in FY2013. Memphis is also a victim of geography as it is only roughly 288nm from Delta’s Atlanta hub. Cleveland is approximately 274nm from United’s hub at Chicago O’Hare, which is the carrier’s second largest hub based on seat deployment. 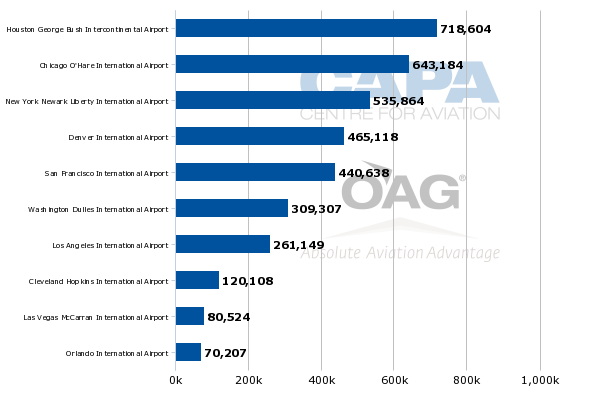 Based on schedules in OAG for the week of 3-Feb-2014 to 9-Feb-2014, United deploys roughly 523,000 more seats from Chicago than Cleveland. Recently United chief revenue officer Jim Compton outlined United’s approach to managing its hubs, which is underpinned by a strategy he referred to as “contribution.” Essentially, United needs to consider the overall economics a route like Houston-Austin brings to the entire system, rather than just focussing on the revenue contribution of local passengers. Ratings agency Fitch in 2011 estimated that roughly 72% of Cleveland’s passengers were O&D, while the city of Chicago in 2012 concluded roughly half of O’Hare’s emplaned passengers were connecting. Cleveland’s geography simply could not produce favourable hub economics in the larger United-Continental network as United works to deliver USD1.2 billion in merger synergies, shore-up its revenue and cut costs. Small regional markets are the biggest losers in United’s Cleveland pull-down. United CEO Jeff Smisek outlined the planned reductions in Cleveland in a now widely circulated letter to employees. Once the downsizing in Cleveland is complete in Jun-2014, United will cut its daily departures by more than 60%, from 199 to 72, the bulk of which are regional routes, which are decreasing by 70%. 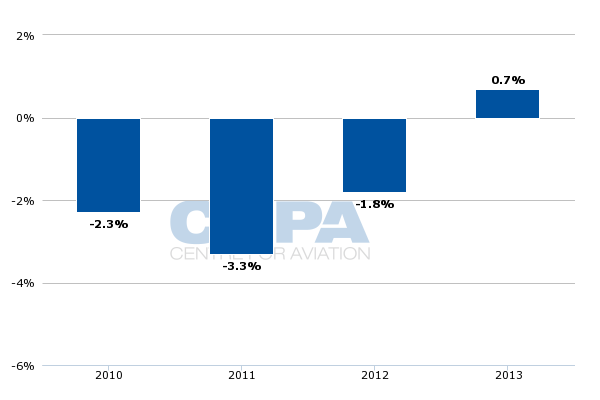 Overall, United’s ASMs in Cleveland are decreasing by 30%. Presently, United accounts for about 70% of the ASMs deployed from Cleveland. CAPA has learned that United plans to retain service to Albany, Baltimore, O’Hare, Dallas/Forth Worth, Denver, Fort Lauderdale, Fort Myers, Houston Intercontinental, Las Vegas, Los Angeles, Milwaukee, LaGuardia, Newark, Orlando, San Francisco, St Louis, Tampa and Washington National and Dulles. Based on current schedules in OAG (3-Feb-2014 to 9-Feb-2014), United serves numerous smaller cities from Cleveland that could be in jeopardy. Those markets include Austin, Bradford, Buffalo, Burlington, Cancun, Louisville, New Orleans, Richmond, Raleigh-Durham, Harrisburg, Greenville-Spartanburg, West Palm Beach, Rochester, Nashville, Grand Rapids, Flint, Erie, Jamestown, Providence, Dayton, Hartford, Dubois, Parkersburg and Syracuse. Additionally, United operates service to major hub cities of its rivals from Cleveland that also appear to be in line for cuts; these include Delta’s hubs in Atlanta and Minneapolis and American’s hubs in Charlotte, Philadelphia, Phoenix and Miami. United serves all of those major hub airports from O’Hare, so service from Cleveland on those routes is somewhat redundant, and likely unprofitable. Mr Smisek explained that pressure in Cleveland has been exacerbated by new US regulations that require an increase in flight experience hours for new pilots from 250 to 1,500. United’s CEO stated that mainline carriers are hiring a higher number of regional pilots, which is creating a shortage at feeder carriers. This in turn requires United to reduce its regional operations, particularly in its most unprofitable markets “which unfortunately are out of Cleveland”, Mr Smisek said. Like its US major rivals Delta and American, United is also reducing its 50-seat jet fleet. 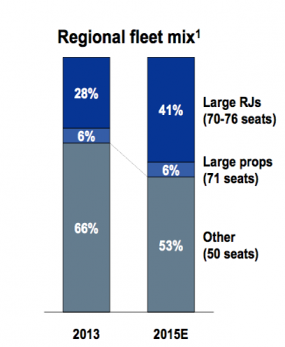 Between 2013 and 2015 United estimates 50-seat jets will comprise 53% of its regional fleet compared with 66% in 2013. Many of the smaller routes United operates from Cleveland are flown with 50-seat jets, so the pull-down is also coinciding with the 50-seat reductions. Could ULCCs be attracted to Cleveland? A recurring theme as consolidation bites is the prospect of low-cost airline entry in markets deserted by the big three as they rationalise their operations. With Frontier now undergoing a ULCC remake and Spirit and Allegiant always on the lookout for opportunities, ports like Cleveland are potential targets for entry. They will be unfazed by the point-to-point profile of existing traffic, although many of the routes being dropped are currently very small. 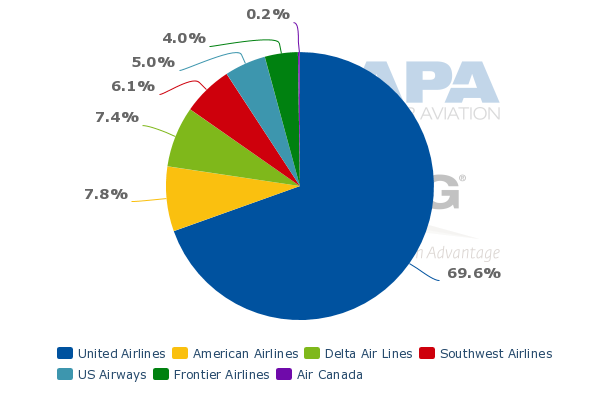 Those carriers believe consolidation among US major airlines does create some opportunities for smaller carriers to expand their networks. Allegiant launched several routes abandoned by AirTran after it was purchased by Southwest Airlines, and Frontier during the past year has introduced flights from Cincinnati (a secondary hub in Delta’s network) to its Denver hub and also serves Cancun and Punta Cana from the airport with less than daily service. Allegiant plans to launch service from Cincinnati to Trenton, New Jersey in Feb-2014. Frontier is also launching new service from its growing focus city of Trenton to Cleveland in Feb-2014, joining the carrier’s existing service from Cleveland to Denver, Cancun and Punta Cana. Allegiant has not really opted to launch service from hubs abandoned by US major carriers, and Cleveland is not a high probability candidate given that United is retaining service to Allegiant’s large leisure destinations of Las Vegas and Orlando and Allegiant has minimal overlap with US major carriers by design. Spirit Airlines has also taken a different approach, working to simulate price-sensitive, lower-yielding traffic in larger metropolitan areas. The legacy carriers mostly leave Spirit alone as the passenger segment Spirit targets does not fetch high yielding revenue. Other LCCs, notably JetBlue, have previously taken on Spirit and succeeded on some routes, so it is not merely the ULCCs that might show interest in the vacuums created as the majors depart. United is opting to curtail its operations at Cleveland at a time when it is trying to sustain profitability, get its unit revenues on par with its industry peers and shed costs. The industry is still waiting for the carrier to deliver synergies nearly four years after the merger of United and Continental produced the current iteration of United. In that regard pulling back Cleveland is a small step in United’s formidable challenge of getting itself on equal footing with its US network competitors. Cleveland’s hub stature was always questionable in the combined United-Continental network as were Memphis and Cincinnati in the tie-up of Northwest and Delta. Although executives made pledges to sustain service levels at those smaller hubs, management inevitably has the responsibility to stave off the losses produced by the inefficiencies of those smaller airports. At some point the scale always tips and fiscal health takes precedence over politics. Hopefully Cleveland will be prepared to embrace its diminished role in United's network and look to reinvigorate other potential operators. There can be little doubt that every exit creates some level of opportunity for new lower cost entrants, especially where there is a demonstrated need for point-to-point service – albeit from a lower cost base. Clearly these O&D markets are valuable economically for Cleveland and there will be considerable mutuality of interest among the affected cities to encouraging replacements for United. As such Cleveland becomes another touchpoint in the process of post-consolidation market changes.